Genuine Fender® Stratocaster® 4 Ply White Pearl (White Moto) HSH Pickguard. Standard 11 Hole. Two Humbucking pickups and one single coil pickup. The Humbucking pickup mounting holes are NOT drilled, this allows the installation of a multitude of different mounting styles of Humbucking pickups where you drill the mounting holes in the correct location for the specific pickups installed. NOTE: Fender® calls this HSH pickguard "White Pearl" but actually is "Aged White Pearl" in color, it is only with the SSS pickguards that there is a differences between the two colors. 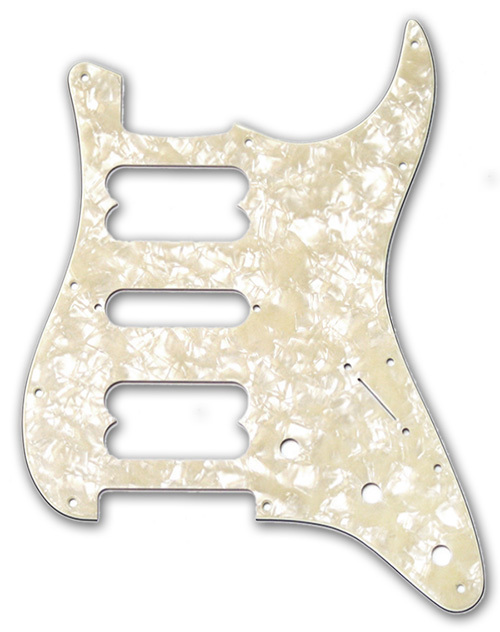 For a matching back plate be sure to order the "Aged White Pearl" 099-1328-000.